Every October, paper crafters all over the world celebrate "World Card Making Day" (WCMD). I'm celebrating by sending Thank You cards to my customers (beginning with my September orders) instead of emails. I've decided to do so from now on. After all, that's a major reason paper crafters, including myself, order Stampin' Up! products, IE. for card making! 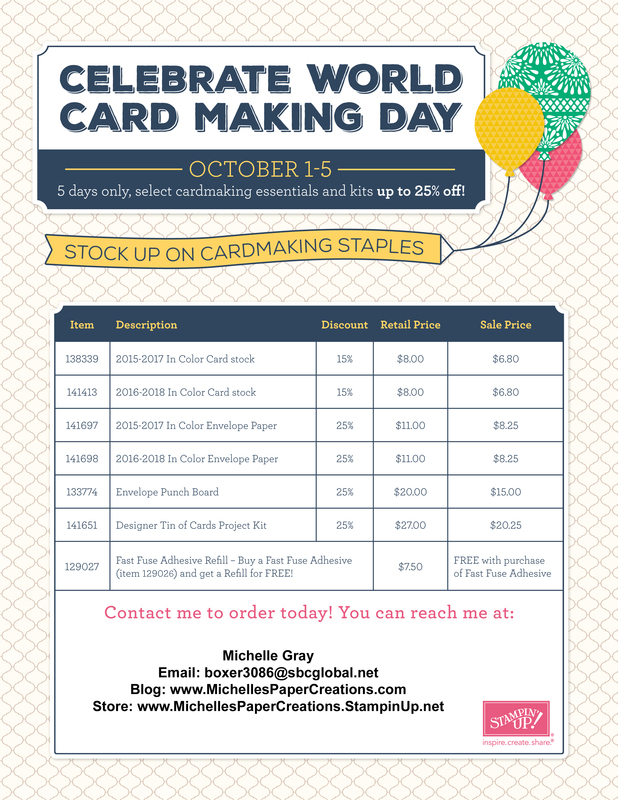 October 1st -31st, the Stampin' Up! corporate office is celebrating WCMD by discounting 8 of their Designer Series Papers (DSP) that are regularly $11 for a 12 pack. The promo is buy 3 DSP packs and get a 4th pack for FREE. Your 4 packs may be any combination of the 8 sale DSP's. I usually order at least 1 pack in each design of Stampin' Up! Designer Series Papers! The DSP's are so varied in colors and styles and are so versatile for card making, gift packaging, scrapbooking, art journaling, art book altering and SO MUCH MORE. I used a favorite long retired DSP to decorate my desktop organizer. How much more attractive and inviting would your work space be if you decorated your file folders and organizers with a gorgeous decorative paper? Mine sure is! I especially like using bits of DSP in my soldered glass and paper sandwich charms and soldered mini-shadowbox charms. Also on sale, but ONLY October 1 - 5: several essential card making supplies will be up to 25% off including adhesive, cardstock and envelopes. You can even get a FREE Fast Fuse refill! See the chart below for the 8 DSP's on sale beginning October 1st. Click on any photo for the enlarged view. Click on the linked name and # to see the DSP in my online store. First 6 DSP's are in the 2016-17 Annual Catalog and the other 2 DSP's are in the 2016 Holiday catalog. Papers not shown below are not included in the Buy3,Get4 Sale. So, if you're ready to order some of the beautiful Designer Series Papers by Stampin' Up! the promo beginning October 1st will make for a 25% bigger bang for your buck. I'll be ordering my 4 packs of DSP, that is for sure. See all of the Stampin' Up! Designer Series papers here. QUESTIONS? Contact me any time! Designer Series Papers, great for all sorts of projects! Shown in this picture: Playful Palette Designer Series Paper Stack, #141657. 64 double-sided 6" x 6" for only $10. You might already know the Stampin' Up! Designer Series Papers (DSP's) is a major addiction of mine. If you look at my retired Stampin' Up! inventory, you'll see quite a lot of DSP's on sale, as well as loads of other paper products. Because I tend to hoard my DSP's, I've been collecting jpg samples to inspire me to actually cut and use them. On the demo site Stampin' Up! recently provided 3 card templates and samples of how to use DSP's. Two of the templates use little bits and pieces, IE perfect to use up your tiny scraps. I love no waste! Click any of the templates or samples for an enlarged view. After cutting DSP for a project, it's really common to have narrow strips left over. Here's a fun way to use them! To get the nice finished end in the strips, use the Banner Triple punch. Or use either the Best Badge punch or even the Sweetheart punch. With this template, you get 6 background pieces at 4" x 5.25" from each 12" x 12" DSP sheet. You'll have a 1" x 12" strip left over for the top template. I love this template because you get to see a nice chunk of the gorgeous DSP. Use a wafer thin die from the Layering Circle Die set or the Layering Square Die set, or any number of the various Die sets to cut the perfect size and shape of solid cardstock for the perfect sentiment. Here's another great template for using DSP scraps with a small Layering Circle or Layering Square Framelit. If you have some decorative papers to play with, now you have 3 great card templates for using your papers. Of course, you can find 100's, if not 1,000's, of ideas if you visit Pinterest and search "Designer Series Papers". If you want to order Designer Series Papers to play with in card making, scrapbooking, gift packaging, art journaling, and many other mixed media arts, shop the Designer Series Paper at my online store and/or my retired papers inventory. NOTE: There's a promo October 1-5 on all of the $11 DSP's, buy 3 get a 4th free. You may want to preview all of the $11 DSP's so you know exactly which you want and order them ASAP on Saturday, October 1st. DSP's do sell out on occasion. Since my creative interests have expanded over the years beyond rubber stamping to all sorts of paper crafts, art journaling, book/journal making as well as mixed media and jewelry making, I'd like that reflected in my blog. Maybe I'll even get some scrapbooking done! Besides a lot of changed links and a wider variety of projects to share, I plan to update the overall look of my blog. It's going to be a time consuming process, because I'm not hiring a website builder. Even so, I chose not to deactivate my blog during reconstruction. The first change: My domain name is now Michelle's Paper Creations. I've also changed the name of my Stampin' Up! website to the same thing, MichellesPaperCreations.StampinUp.net (uppercase not required.) All of the links on my Stampin' Up! website changed automatically with the change of the name, which was a huge time saver. Not so with my Typepad blog(s). I'm waiting to hear back from Typepad to find out how I can change my blog links to reflect the domain name change. So in the meantime, when you click on a link in posts or my sidebar, the url will have the original name of Nuts4Stampin. If you happen to come across a link not working or something that doesn't seem quite right about my blog, please do me the favor of emailing me at boxer3086@sbcglobal.net There is a lot that goes into updating a blog, especially with a new domain name, so I might miss something along the way. I'd really appreciate your input. I guess that's all for now about my new domain name. But that's not all about Stampin' Up! Remember, the 2015-16 annual catalog and the 2016 Occasions catalog expire May 31st, so if there is anything on the retiring list that you've got to have, make sure to order before things are sold out. To review what's not carrying over to the new catalog, please see this blog post, or click on the graphic below to go directly to the Retiring Products category page at my online store. With this news of expanding and updating my blog, you'll want to subscribe to my blog post by email so you don't miss anything new. To subscribe to my blog posts, simply enter your e-address under "SUBSCRIBE HERE!" in my sidebar and click on "Subscribe". Hi Friends! I hope you enjoyed your July 4th holiday weekend. My husband and I relaxed and had the traditional BBQ hot dogs and pasta salad. Yummy! I also spent time on Pinterest and blogging plus learning how to use MailChimp and figuring out how to pair my blog with Feedburner. I think I have it. Guess I'll know when I start seeing new subscribers (hint hint) to this blog and getting emails of my posts. On Pinterest I was seeking examples and tutorials for mini books, albums and journals. I found lots of great pins. While on Pinterest, I remembered pictures I saved of something that made me really happy and proud. That is a handmade art journal. Though I enjoy the Stampin' Up! ready to assemble card and project kits, including My Paper Pumpkin of course, I also love making small books and journals completely from scratch. When I say from scratch, I mean using heavy chipboard or bookbinding board for the covers and spine and decorating them with decorative papers, modeling paste and other mixed media materials and supplies. In fact, I enjoy making the books and journals more than I enjoy filling the pages once the journal or album is made. Don't know why! But I just love paper crafting in general. As a member of an online artist community called Journal Journey, last December I made the below journal for my "junk It" journaling. I didn't use Stampin' Up! products for this journal, but I have plans for several more mini books and journals using many of my Stampin' Up! materials/supplies. Don't you just love all of the heavy texture I created with modeling paste and stencils. Now that Stampin' Up! offers stencils, aka decorative masks, I look forward to using them on my next journal cover. On this journal I did lots of layering of color with acrylic paints and other fun medium. Betting I can use Versamark and embossing powders with the stencils along with my Classic Stampin' pads for texture and color. Stampin' Up! also offers great trims to use for stitching the binding. For now though, here are a couple more pictures of my "Junk It" Journal. Well, that's it for now. I welcome comments and questions about my projects and the products mentioned in any and all posts. If you want to see more projects like this, please let me know and be sure to subscribe so you see them when I blog about them. If you have any of the Stampin' Up! products listed above on your wish list, Click here to order. Please use hostess code 9SHKV6BE unless you're ordering $150 or more and then you get keep the hostess goodies for yourself. If you've been following my blog for even a short time, you know I'm really drawn to the Stampin' Up! kits. It started with subscribing to the My Paper Pumpkin kits (MPP). I saw/felt the quality of the MPP kit contents, so I decided to try some of the other kits. First I bought the retired Gratitude for Days Simply Created kit, from the 2014 Holiday catalog, page 38. I shared a little about the kit in this blog post. Here's another look at the kit contents. And here's a picture of the assembled originally intended advent calendar. The retired Gratitude for Days Simply Created kit, originally $21.95 and designed as an advent calendar, is still in the clearance rack for only $8.79! At that price I had to have the kit. When I got it, it looked way too fun to save for the 2015 advent season. Instead I made a really cute mini album, aka a 10 pocket page brag book. I 'm making something else with the rest of the kit. Here's a couple pictures of my mini album/brag book. I've just gotten started adding photos of our boxer boy, Trevor, aka "Mr. T". I'm going to fill the brag book with photos of all the fur babies my husband and I have adopted. Along with the kit contents, I used a variety of punches and adhesives as listed at the bottom of this post. I used a two-hole punch from an office supply store and 2 loose binder rings to hold the album together. In addition to my mini album, I could also make 20 to 40 pocket cards with the addition of cardstock for the card bases. The below picture shows examples. Click here for dozens more ideas as shown on Pinterest. For a fast and fun project at a fantastic price, the Gratitude For Days Simply Created kit is a really great option. It's a value packed project, for sure, to create for yourself or as gifts.You could make 3 brag books of your kids for their grandmothers and/or aunts or to carry in your own purse. Or make up to 60 greeting cards packed into gift sets for 6 to 10 people who enjoy sending hand-crafted cards. The possibilities are endless! Remember, the kit is retired and it will be available only while supplies last, so don't wait to order. It could sell out any day! Really! Click here to order. Please use hostess code 9SHKV6BE unless you're ordering $150 or more and then you get keep the hostess goodies for yourself. If you have questions about the above kit or anything else currently available from Stampin' Up!, please feel free to email me.